Although I didn't make it to Essen this year (yet again...), in the past couple months I have been browsing the rules of the many new releases. It seems to me that a lot of the most well-received games this season have REALLY complicated rules (see the rules for Shipyard or the various strata of rules for Dungeon Lords). They may be quite good but they'll probably never get played by my group. Sigh. Two games, Tobago and Gonzaga, however, are recent releases whose rules actually seem relatively reasonable and look like they could be a lot of fun. Thanks to a lovely birthday gift from my brother, Tobago is now in my possession and has been played a couple times now. So is it good? Oh, yeah. It's great (you can see some pictures of Tobago here). This may well be the highlight of the game. The components are beautiful! The game comes with wooden huts and palm trees and little stone Easter Island statues. Everything looks and feels authentic and it really adds to the experience. The board is beautiful and extremely well thought out. It comes in three pieces which can be arranged in 32 possible configurations, making a different spread for every game. The most interesting thing is that no matter how you arrange the board there will always be a largest area of each type of land mass. Very cool. Verdict: Beautiful and highly functional. Just great. As I mentioned earlier, one of the main draws of this game came from reading the rules early on. They seemed relatively simple and intuitive. And they are. The rulebook clearly explains everything and because many of the ideas in this game are so thematic and unique, they seem easier to pick up and remember. The rulebook also has lots of pictures and examples, making the game a breeze to learn. Verdict: Excellent. 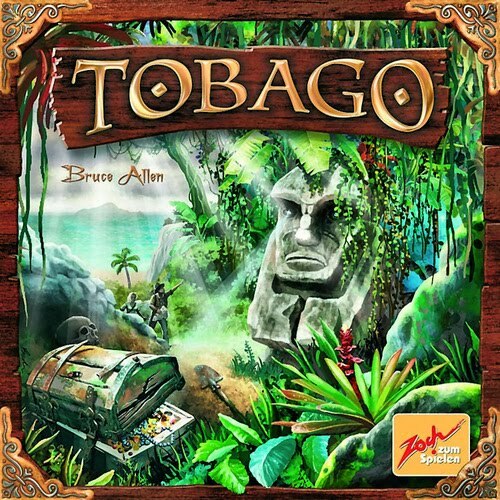 In the game you play an explorer on the island of Tobago, searching for one of four buried treasures. There are a few really clever interrelated game mechanics going on. First, you play cards on the columns corresponding to the four different treasures. Each card narrows down the area where the treasure could be (i.e. NOT in the largest lake, on the beach, beside one of the palm trees, etc.) As the possible locations are narrowed down, the cubes representing that treasure are removed from the board until there is eventually only one space left. And here's where the next major gameplay mechanic comes in. Instead of narrowing down one of the treasure locations, you can choose to drive your little wooden jeep (jeeple!) and grab the treasure if there is only one cube left. There are a few rules to moving the jeep and how far it can go, but they aren't complicated and add just enough choice to make things interesting. Once a treasure is captured, the players who contributed cards to that column get to share in the spoils. And this is where things get even more interesting. Each player has marked the cards they added to that treasure column with the player capturing the cube adding one extra marker. A set of treasure cards of varying value is made up, with each contributing player being able to look at a few. The first gets flipped and the players, in order of discovery, get to claim one with each marker they played. Tricky, and quite fun. And just to throw a wrench in the gears, there are two nasty cards that cause each player to lose their best treasure if they have not yet claimed one. You really need to see the treasure drawing in action to have it make sense but it adds a ton of tension, interaction, and laughs to an already fun game. Once treasures are given out, one more wrench is thrown in the gears. The three giant stone statues shoot laser eyes at the coast and where their gaze hits the shore, magic amulets arise from the depths of the ocean. Seriously. Okay, so it may not be that dramatic but every time this happens the board is seeded with three amulets that the players can pick up with their jeeples. These amulets offer many powers including free turns and removing location cubes. Great stuff and quite fun to make noises as the statues slowly turn 60 degrees. Ka-chunka-chunk. Verdict: Varied and fun but not too complicated. Okay, so I always like a bit of strategy in all my games (a lot if a game is particularly long). Tobago is more about tactics than long-term strategy and throws in a big old dose of luck during the treasure draws. But it always offers you tons of choices. Should I narrow down a treasure and get in on the rewards or should I go and pick up that amulet that will help me out? Can I narrow down the treasure so it is closer to the location of my jeep? There's tons of choice every turn but the game plays really fast and tends to keep everyone involved. If I were to compare it to something, I'd say it's about as deep as Blue Moon City. But given the short play time (less than an hour) this one hits a home run on balance between fun and strategy. Verdict: Not a brain-burner but something you'll wanna replay again to figure out the best moves. What can I say? I really love this game. It plays unlike anything else in my collection, it's easy to explain, the components are gorgeous, and it's just a whole lot of fun. I predicted previously that Eine Frage Der Ahre might be a Spiel des Jahres contender next year. This one is a guarantee. Pick it up, you won't regret it. I've had this game for almost two weeks now, but have yet to play it. Reviews like this get me excited to play it, but I'm trying to temper my expectations to avoid even mild disappointment. Next weekend this will be the first game we play . . . I think you'll like it. It's pretty cool.... Let me know how it goes! It's not December yet, is it?